After playing 99% of games in the last 11 years, Adam Goodes is one of the most reliable premium forwards going around. But at the age of 32… is the best behind this Brownlow medalist? Join Calvin as he breaks it down for you, Jonah Takalua style. Lets’ start talking about Adam Goodes’ durability. 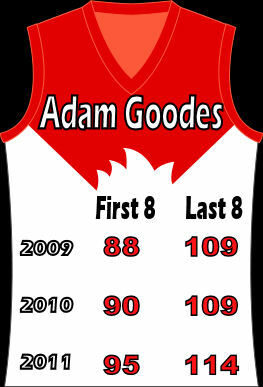 Over his last 11 seasons Goodes has played 239 games of the 242 available (99%)… this is truly amazing. Not many people in the AFL carry such an impressive record. “But he’s too old Calvin”… Yes he’s old… but although he’s been 30+ years old for a few years now and he has still played the last 66 games straight! Plus… Goodes has been extremely consistent over this period (3 years) and has averaged 98.9 (2009), 94.6 (2010) and 99.2 (2011) proving himself to be one of the best premium forwards going around. Goodes is also another DPP. Our forward lines this year will be loaded with these guys, which adds more flexibility to your line up. Goodes loves to smash certain teams and plays the GWS twice in 2012. Last year he averaged 121 on the Lions, 130 on the Bombers and 140 on the Bulldogs who he also plays twice this year and finds himself coming off 6×100+ games against them in his last 6 games. Captain anyone? Ha ha we’ll have to wait and see what the pirate says about that one at a later date. He’s old… he’s 32, but I have sort of put that excuse to bed already. So try this one on for size. DO NOT START WITH HIM. Adam Goodes is a famous for his slow starts before flying home like a steam train. Check out the trendy graphic I have made illustrating this point of what he averages in the first 8 games of a season compared to the last 8 games. Deck of DT Rating. KING – Adam Goodes is destined for another solid year of playing every game (touch wood)… ha ha dirty joke, and will most likely hold his average of 95ish. My main point here today is… grab Goodesy at a later date, do not start with him and enjoy the ride home as he will smash it like he usually does. TWITTER @CalvinDT for advice on trendy graphics and DT advice. Nice write up Vin, saw it was 5:30am and was going to go to bed, but thought stuff it, I’m going to stay up for DoDT. Making the decision on who to pick is sometimes made easier knowing who not to include. Great right up! You have confirmed what we all thought. Get Goodes later! Looks like a debut in rnd 14 vs GWS! Good call Calvin. It is his DPP that gives him the most value. Aye Captain! He was so Goodes to me last year, I was sailing with him right from the start! Sure, there was a score in the 40’s one in the 60’s and a few days when he was living in the 70’s, but the man stood up! I don’t know why, but I am not starting with him this year. I’m loading up on egotistical genetic freaks who are young and into DP’s, I mean, have DP status. When one of the wonderkind goes down with a bruised ego, or forgets that you can’t drink alcohol and assault women while driving drunk, I can pick up the master. Having Goodes from the start last year was like believing in God. You know it’s risky cause he is so old, but the blind faith pays off because you go to sleep knowing you have the master in your corner! By the way Calvin, that graphic is a phenomenon. I have George Lucas on the phone and he want’s you to digitally remaster the Star Wars prequels with you computer graphic skills. Apparently, he want’s Jar Jar binks edited out, and a two headed Goodes/Roc creature to take it’s place. It’s a good paying gig mate. Just remember who hooked you up, and man, if you go to Hollywood and pull Scarlet Johanson, remember me when your in the throes! Last year, in their first 8 games, Sydney played Melbourne, Essendon, West Coast, Geelong, Carlton, Western Bulldogs, Pt Adelaide & Hawthorn … not exactly the easiest run of games, 5 teams in the Top 6. NOW, let’s look to 2012. This year, their first 8 games are: GWS, Fremantle, Port Adelaide, Kangaroos, Hawthorn, Adelaide, Richmond & Melbourne … HOLY CRAPPIN’ EASY!!! Only 1 team from last year’s Top 8!!!!!!! I rest my case … Goodes is a LOCK for Round 1 (as with 1-2 other Sydney players going by this draw). Had him from rnd 1 last yr… Will do the same again. His lower ave at the beginning of yr is not hat bad. You no what you get with him. Which of Melbourne, Essendon, Western Bulldogs and Pt. Adelaide was in the top 6? The issue early on in the seasonisn’t the teams Goodes comes up against, it’s Goodes himself. DT wise it takes the champ a while to hit top gear. As he builds up his fitness by mid season, it then doesn’t matter who he plays because he destroys everyone. The Champ times his runs perfectly, and so should you! This guy is freakishly good. Maybe worth looking at later on. Great write up as usual Vin, and what an absolute champion player Adam Goodes is. Among his many accomplishments, also voted Marngrook Footy Show “deadliest” player awards three years running now. DT wise, as noted above, he is super durable and reliable and I love players I can set and forget. A 90+ average is fine with me considering there’s really not a lot on offer in the established forward ranks. More than likely a lock for me, and same for his brother Christenson, who I think is the pick of the Robinson/Sillybottom fwd/mid types. Great read Calvin, will be an upgrade target later on in the year! Honestly, I wouldn’t be surprised if you’re still doing DoDT cards on this guy in 2015. He’s an absolute freak. Unless we’re given a concrete reason not to select him during the pre-season, I’m gonna lock him in. The rest of you can join me or you can fall behind :). Yeah Goodesy is really good against the bombers, http://www.youtube.com/watch?v=3zjj5AAWVFk. On a DT note, he will certainly not get an initial gig but if he finds some swell form later on he’ll be an upgrade target. i dont think last yrs first 8 games were that hard ,he usually kills west coast and for a player as good as him i think that first 8 wasnt that bad at all,but the stats dont lie i spoz. though i would think with him being the age he is heez a big chance to play better early in the season than late…if i was gonna take him id take him from the start and hope that his ave stays the same as previous yrs. He is in the next DT TALK epsiode! Stay tuned! no harm in waiting until mid season on googles. its not like you missing the boat and he will become alot more expensive than his starting price. Nice write up Calvin, penciled in for after the bye! I’m so pleased the deck brings up all these players we should have and how many of them have been locked in by everyone. I now have 48 players locked in. LOL. I’ve been thinking along the same lines PA. Sydney players in the first half of the year, Richmond and Melbourne players as upgrades. Sydney are a good bet to be 7-4, maybe 8-3 at the halfway point of the year.